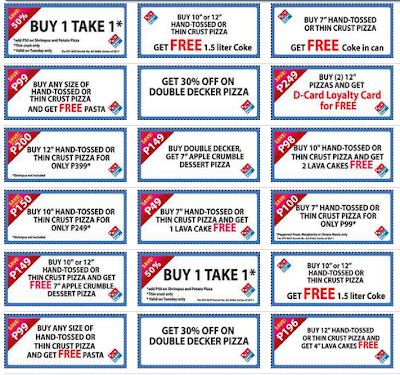 Domino's and Pizza Hut Promos ~ Philippine Freebies, Promos, Contests and MORE! Satisfy your Pizza cravings by taking advantage of these 2 promos I found Domino's and Pizza Hut currently are offering. Visit any of Domino's Pizza chain near you and use a coupon for every pizza you order. They have seven (7) branches where you can use any of the eighteen (18) cost-saving coupons. Enjoy buy 1 take 1, FREE pizza, cakes, or save up to 50% off in every order. Pizza hut also have awesome offerings with their 50% Wow savers. Choose from any of the 3 pre-selected items available per day at half the price. Boy Kuripot claims no credit for any images/videos featured on this site unless otherwise noted. All visual content is copyright to it’s respectful owners(links). Boy Kuripot is in no way responsible for or has control of the content of any external web site links. Information on this site may contain errors or inaccuracies; Boy Kuripot does not make warranty as to the correctness or reliability of the site’s content. If you own rights to any of the images, and do not wish them to appear on this site, please contact Boy Kuripot via e-mail and they will be promptly removed.